A third Ghostbusters movie arrived in cinemas this week after decades of trying to revive the comedy sci-fi series. But for many fans, including some of the folks who made Ghostbusters, the third film was a 2009 video game. Dan Aykroyd and Harold Ramis co-wrote the original Ghostbusters film, and though the two hoped to produce more films, a number of factors prevented its return. Namely, actor Bill Murray didn’t want to come back. That changed when he saw the final script for Ghostbusters: The Video Game. Ramis and Aykroyd would send Murray different scripts over the years, hoping to entice him back. One version famously killed Murray’s character, Peter Venkman, in the opening, limiting how much time he would have to be involved. “It was kind of funny, but not well executed,” he said. “I found myself walking down 5th avenue doing the song. [laughs] People must have thought ‘God, that guy’s really full of himself.’"
It’s always seemed Murray wasn’t literally opposed to strapping on another proton pack, but his career was doing fine without Ghostbusters. If he was going to return, it needed to happen because there was a good reason. Case in point, he didn’t have to provide his voice for Ghostbusters: The Video Game, but he was intrigued. (Only having to show up to a recording booth probably helped.) That experience re-opened his mind to the character. There were plenty of Ghostbusters games produced in the '80s and '90s, but it eventually died down. In 2006, the otherwise unknown Slovenian developer ZootFly uploaded a series of videos to YouTube teasing a Ghostbusters video game, showing an especially impressive take on combat. It was a cool concept, though, and ignited fan interest. Developer Terminal Reality happened to working on their own Ghostbusters pitch at the time, and though Zootfly’s experiment didn’t go anywhere, it greased the wheels for Terminal Reality getting the green-light. 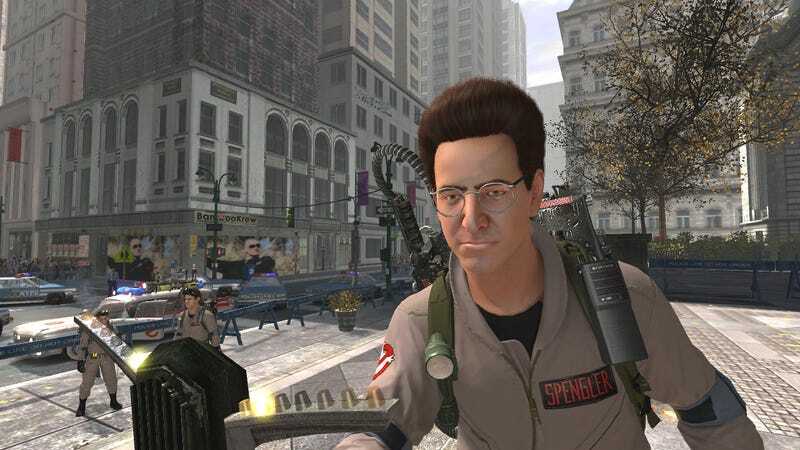 The game’s production was troubled by corporate manoeuvrings, as Sierra Entertainment had previously brokered the deal for a Ghostbusters game. When Vivendi, its parent company, merged its Activision label with Blizzard, Ghostbusters was put in doubt. Infogrames later snatched up the rights, and the game was ultimately published through the Atari label. Terminal Reality reportedly worked closely with Aykroyd and Ramis to develop the script, which included a number of the more fantastical elements planned for the original movie. In terms of the timeline, it’s set after the events of Ghostbusters 2. More than 300 lines of dialogue were written for the game, with the full script expanding to more than 600 pages. According to the Guardian, Murray had a single demand for coming back to the role: “an assurance that Winston Zeddemore, the underwritten black character from the movies, would be elevated to full status”. Zeddemore, played by actor Ernie Hudson, has routinely been scrubbed from full Ghostbuster status over the years, especially in the marketing. Even the most recent Blu-ray only depicts Aykroyd, Ramis, and Murray. One character who didn’t show up for the game, however, was actress Sigourney Weaver. She was asked to reprise her role but declined. It’s a little more complicated than that. Weaver did turn down an offer to be in Ghostbusters: The Video Game, fearing it would be crappy, but when she learned Murray was involved, she changed her mind. At that point, however, production was too far along to add her in. It didn’t help that she’d had poor experiences with game pitches before, specifically related to Ripley in the Alien series. Can’t really blame her for that one. It’s highly unlikely the original lineup of Ghostbusters will be on-screen again together, meaning Ghostbusters: The Video Game will serve as an unofficial Ghostbusters 3 for many. One fan even chopped up the gameplay and cutscenes to produce a “movie” version of the game. This video was published after Feig’s reboot had been announced. Ghostbusters: The Video Game was intended to kick off a Ghostbusters revival, with Aykroyd and Ramis kicking around script ideas from new writers. (The untimely death of Ramis is what prompted the project to seek a new slate of ghost hunters.) And though Ghostbusters: The Video Game was financially successfully, selling more than a million units in its first month, future games never went anywhere. Terminal Reality shut down in 2013. The most recent Ghostbusters game is, unfortunately, pretty bad.